I'm still a bit hobbled with my new hip this week and I'm trying to take it easy so I took on a few less physically demanding tasks this week. The leathering on the mast step I did the week before surgery was actually fairly fun so I was looking forward to working on the spar leathers to prevent chafing. 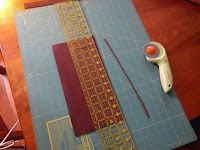 The problem is that I have never done any stitching, let alone on thick leather. Lucky for me though, the interwebs are full of tutorials and videos detailing every step of the process. I started with the mizzen yard because it was the smallest and hopefully not too visible knowing that I'm never all that great on the first go round. I figured that by the time I got to the main boom, my work would be acceptable. Next I marked a line 1/4" from the edge of each side and took a four hole leather punch and hammered out holes on both sides. 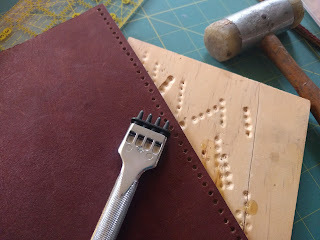 I found the leather punch at Hobby Lobby and it works quite well as long as you put the leather your working with over a piece of softwood so when you hammer on the punch there is something for the punch to dig into once it pierces the leather. I applied a coat of contact cement to the back of the leather and the area on the yard where the leather will be covering and then pressed it in place and held it there with a spring clamp. 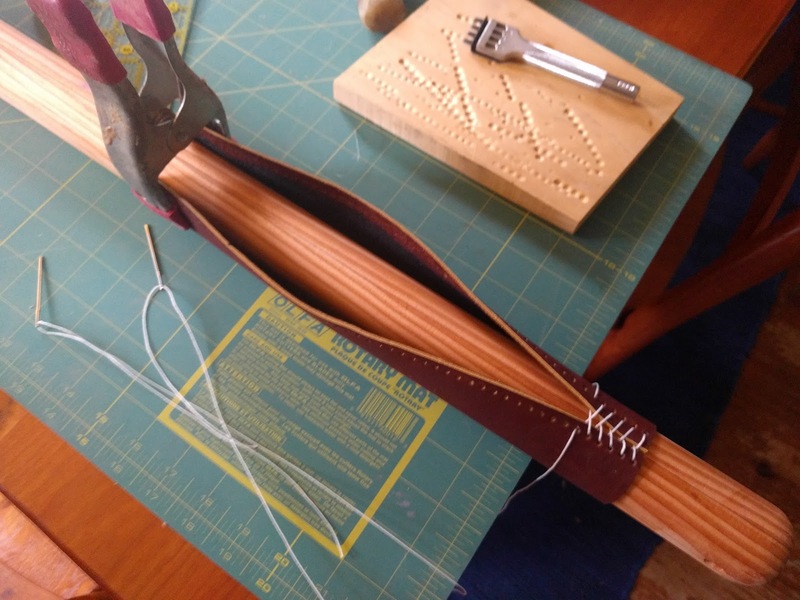 Using waxed sail twine, I unrolled about 7 feet or so and fitted a big sailcloth needle on either end. 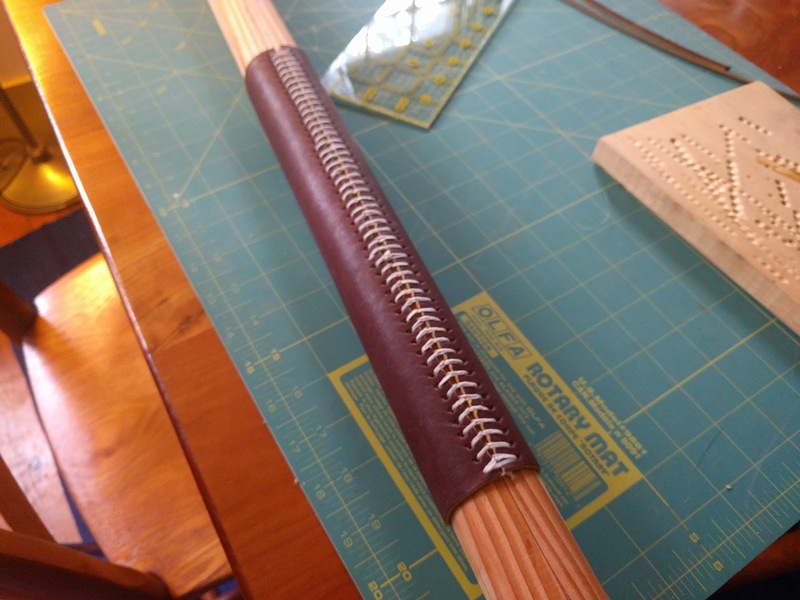 I won't go into detail of the herring stitch (aka baseball stitch) because there are literally hundreds of tutorials online that describe it better than I can, but it is pretty simple and easy to do as long as you pay reasonable attention. My mind did wander a bit a few times and I skipped a stitch and was forced to redo a few rows, but overall it went pretty well and it took about 30 minutes to do the whole thing. It's not perfect, but it seems strong and should provide good chafing protection. Just three more to do and I expect each one will get better as I perfect the technique.